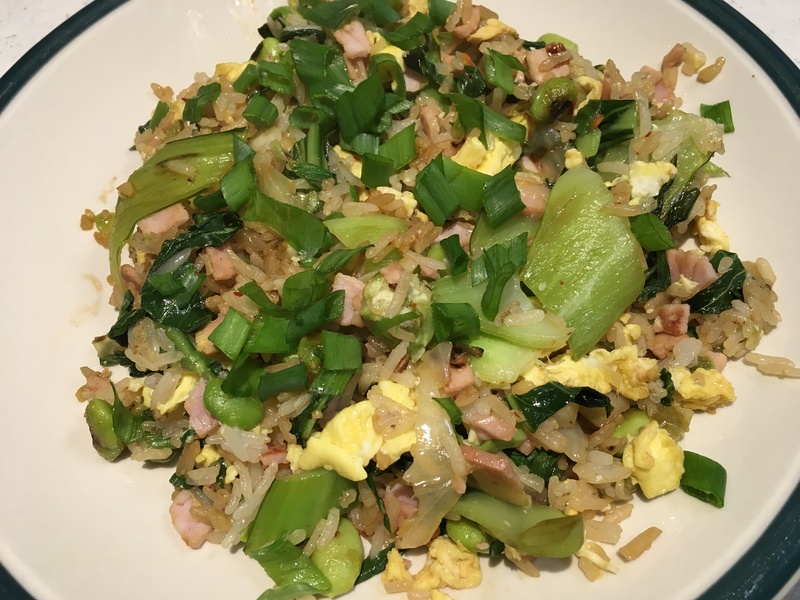 Fried rice! What are your favorite ingredients and techniques? Aha! That makes a lot more sense. it would make more sense if I use my reading glasses!!! Sent from my iPhone while intoxicated - please excuse any spelling mistakes, grammatical errors, or inappropriate comments. I so so so wanted it to be a new CheezWhiz type spray on Spam product. Thanks to this (highly entertaining!) 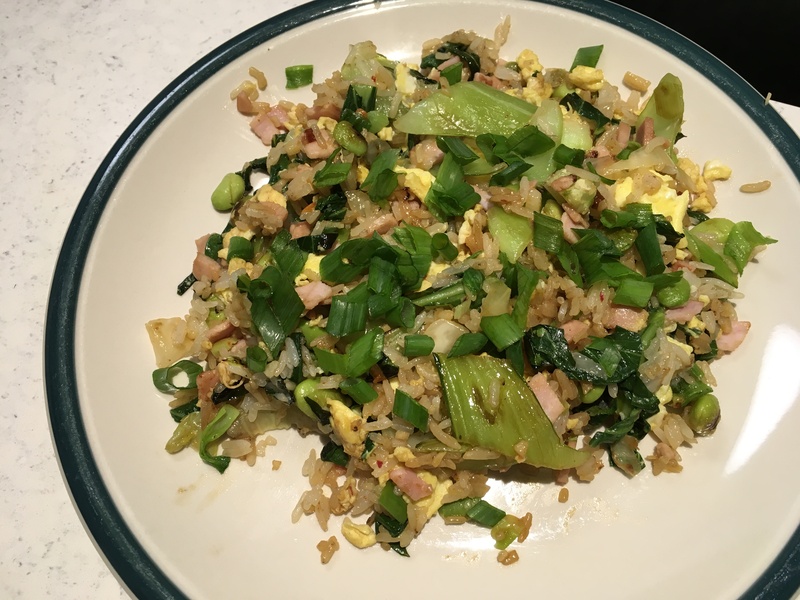 thread I had delicious fried rice for dinner tonight using my favorite recipe, but a one-serving version using 1 cup of still-frozen TJ’s jasmine rice and nearly 2 cups of baby bok choy, edamame and kimchi, plus the other goodies. It was ginger-heavy which suits me. Soooo good!! Thanks for the inspiration!!! 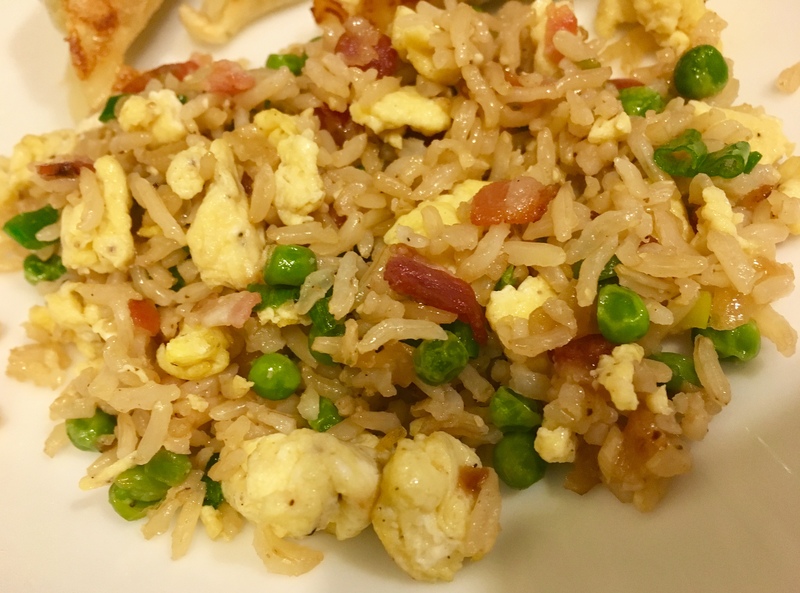 Fried rice here tonight too: this version had eggs, scallions, peas, and someone requested… bacon! I think my computer auto corrects my spelling sometimes. 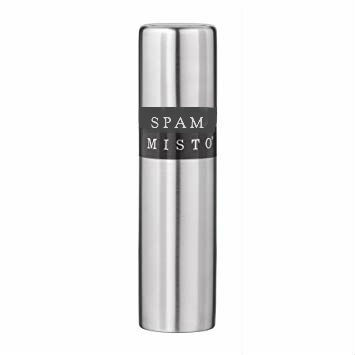 As for the SPAM MISTO, I have had those but found it clogged up easily ( purchased 2X from Costco bec of packaging, - so after 4 bottles, discontinued by Costco, decided to find alternative. That is filled with EVOO that I spritz on food, ie potatoes which I want to bake in oven instead of wasting a whole lot of EVOO in a small bowl, and having to wash the silicone brush, spring rolls which I sometimes prefer bake to bake rather than fry and last night’s dinner, baked. chicken in oven instead of fry but suggestion is to spritz the panic with olive oil. The company is small, very attentive to their buyers. Once, the spayer got clogged up, I sent them an email, to which they responded immediately. So, if it clogs up, they advised to discard oil if it is in container too long, and how to clean it. Cleaning is easier since the bottle is glass. Since the, I. have had no problem as I do not load it up to the brim so I will not have stagnant stale oil. The canola oil spray is still a veery useful item for me to spray the grill of my BBQ, the smoker, the plancha as well as the interior tin of various copper pots and most important, the tin of the copper lid if I am using them per suggested . I did, see below. Very satisfied with it. Just do not fill it both brim too much( suggest an inch or two - I feel it halfway now and has had no problem since) so oil does not get stale unless you can use that oil much quicker. REFILL AND REUSE - This unique model produces such a FINE MIST you use so little oil it will last for weeks. 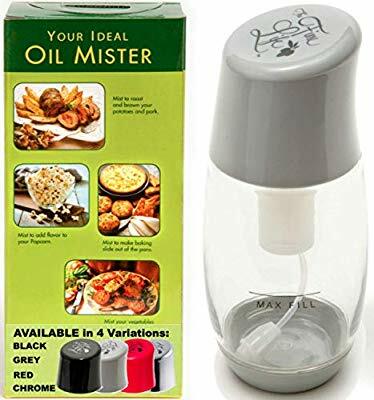 The perfect cooking oil accessory your air fryer, grilling and baking. Fill it with an inch or two of olive oil. The rest of the space lets you pump up AIR pressure. Use your favorite oils for popcorn, salad, veggies, fish, meats, omelettes. - Even INFUSE your own flavors. The clear container lets you see exactly what’s inside and the premium filter makes sure only pure oil is spritzed. I love this thread! But my brain hurts from all the variety its being exposed to. I haven’t had any issues with my Misto, but I appreciate the recommendation for a replacement, if I ever need one. I use it all the time, on potatoes (as you do), and on salads. It’s also great for misting baked pasta before running it under the broiler. Yes there is!..you use it and there is an automatic device on your stove that sends it to the trash! No, phreddy, it is not an automatic devise that sends the melted ice to the trash. I have to scrape the plancha , remove whatever left over food and oil that is there , turn it to 500 degrees, pour ice on it , then scoop the melted ice into that side channel, empty and send to trash myself. Should not complain as it is still easier to clean than most stand alone plancha that sits on top of stove. As a master plumber ( if my memory is correct) , you can understand that with septic, I prefer not to dump any oil into my system so , if there is too much oil, I have to either dump them in a container to bring to dump. Beans and rice are a staple in my family. I like to elevate a simple side dish with a zest of flavor without adding a lot of time to my meal prep. In a large pot, bring broth and rice to a boil. Reduce heat, cover, and simmer for 15-20 minutes until rice is tender. Remove from heat and scoop into a bowl. Mix in garlic, lime juice, black beans, and cilantro. Season with salt to taste.